Samsung Electronics' IT & Mobile unit reported shipment growth in phones but noted that its "profitability declined" due to the fire sale pricing incurred to boost sales of its disappointing Galaxy S6, along with a lower handset Average Selling Price "due to increased sales of mid- to low-end products." Samsung Mobile profits rose to 2.40 trillion won (US $2.09B) from 1.75 trillion (US $1.53B) in the year ago quarter, but remain far below the 6.28 trillion won (US $5.49B) in quarterly profits the group reported back in the middle of 2013, when pundits and marketing groups such as Strategy Analytics were suggesting (albeit inaccurately) that Samsung had surpassed Apple in handset profits. While Samsung has seen its phone and tablet profits implode over the past year, Apple just reported quarterly profits of $11.1 billion, twice that of Samsung Mobile at peak-Galaxy and five times what it is now earning. Apple's blockbuster results come despite the export handicap of a stronger U.S. dollar, while Samsung's profit performance has been exaggerated due to a weak Korean Won. Samsung credited currency markets for adding 800 billion won (US $700 million) to its stated results. In addition to building phones, tablets, music players and other products comparable to Apple's operations, the Samsung Mobile division also sells networking equipment, which contributed to offset the decline in profitability of its beleaguered smartphone business. Network profits "improved QoQ due to overseas carriers' LTE network expansion," the company stated in its earnings report. A report by CNBC claimed that the profitability in Samsung's mobile division was "lifted by sales of the Galaxy Note 5 as well as new lower-end products," but that's not what the company itself reported. Samsung said its unit shipment growth had been driven by the release of new models, but explicitly noted both a "slight increase in revenue while profitability declined," and a "lower ASP due to a sales mix of lower-end smartphones." Android Central also incorrectly reported that Samsung's mobile growth was "largely driven by a significant increase in smartphone shipments from the Galaxy Note 5 and Galaxy S6 edge+," when in reality Samsung only credited networking gear sales with improving its Mobile division profits, adding that tablet demand was weak and that earnings from tablets remained flat. 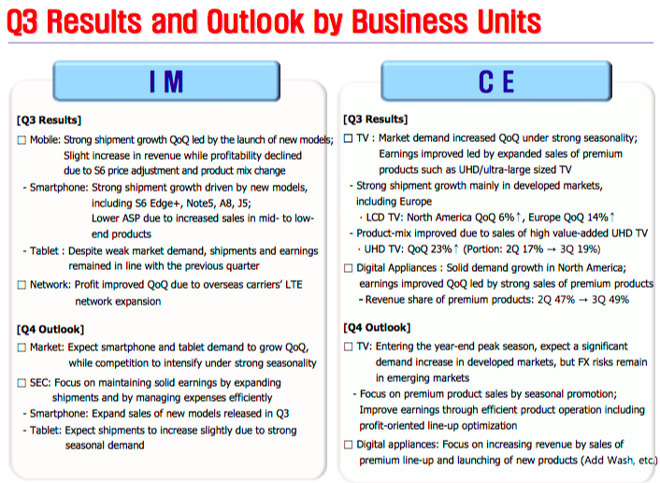 Looking forward, Samsung expects its smartphone and tablet unit sales to grow, "while competition [is expected] to intensify under strong seasonality," without commenting on its expected handset profits. Earlier this month, analysts told the Wall Street Journal that Samsung's chip division was likely responsible for about half of the company's profits this quarter; Samsung has now reported that 63 percent of its total profits came from its Device Solutions group, which includes semiconductor chips and display components. Apple is a major customer of Samsung's Device Solutions group, but a direct competitor of Samsung Mobile, which it has accused of shamelessly copying its work after suffering a "crisis of design" in response to Apple's iPhone. Two years ago, Samsung Mobile was the most profitable segment within Samsung Electronics, contributing 65.9 percent of its total profits. The group now accounts for just 32.4 percent of its profits, a dramatic reversal directly attributed to the implosion of higher-end Galaxy products wrought by the launch of iPhone 6. CNBC did note that "despite a major overhaul of its product lineup, researcher TrendForce says Samsung's smartphone shipments will shrink for the first time in 2015 due to competition from Apple Inc in the high-end market and Chinese rivals in the low end."